This article is about the 1993 film. For the 1974 film, see Godzilla vs. Mechagodzilla. For the 2002 film, see Godzilla Against Mechagodzilla. 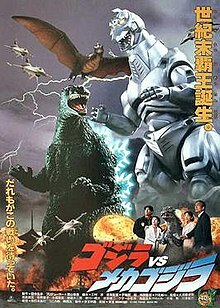 Godzilla vs. Mechagodzilla II (ゴジラvsメカゴジラ, Gojira tai Mekagojira, released in Japan as Godzilla vs. Mechagodzilla), is a 1993 Japanese science fiction tokusatsu kaiju film featuring Godzilla, produced and distributed by Toho. The film is directed by Takao Okawara and is the 20th film in the Godzilla franchise and the fifth film in the Heisei series. Despite its Japanese and English titles, the film is not a sequel to 1974's Godzilla vs. Mechagodzilla. The film was released in Japan on December 11, 1993 and released straight to pay-per-view satellite television in the United States in 1998 by Sony Pictures Television. The film was initially heavily promoted through advertising and a spin-off children's television program as the last film in the Heisei Godzilla series, as Toho producers wished to avoid competing with TriStar's then upcoming Godzilla reboot. In 1992, the United Nations establishes the United Nations Godzilla Countermeasures Center (UNGCC) to stop Godzilla. The mechanical middle head of Mecha-King Ghidorah is salvaged by the UNGCC's military branch, known as G-Force, and reverse engineered to create two anti-Godzilla machines, the first being an aerial gunship called Garuda and a mecha modeled after Godzilla called Mechagodzilla. Two years later, on a mission to Adona Island in the Bering Sea, a Japanese team comes across what they assume is a large Pteranodon egg. The egg gives off a telepathic signal that attracts Godzilla and Rodan, an adult Pteranodon irradiated by the nuclear waste. Godzilla critically wounds Rodan during the ensuing battle, while the research team escapes with the egg. It's taken to a research center in Kyoto, where it imprints on a young female scientist. When a Baby Godzilla hatches from the egg, the research team concludes that the egg was left in the Pteranodon nest with Rodan in a manner similar to the brood parasitism displayed by European cuckoos. Godzilla appears in Japan, once again responding to the creature's psychic call. The JSDF mobilizes Mechagodzilla, which intercepts Godzilla as it is making his way to Kyoto. The two battle, with Mechagodzilla seeming to have the upper hand until Godzilla disables Mechagodzilla with an energy pulse. Godzilla continues searching for Baby, but the scientists, having discovered the telepathic link between the monsters, shield it from Godzilla. Frustrated, Godzilla destroys most of Kyoto before returning to the ocean. Tests on the baby reveal that it has a second brain in its hips that controls the animal's movement. The UNGCC assumes that this also holds true for Godzilla, and decide to use Baby to bait Godzilla into a fight with Mechagodzilla. The "G-Crusher" is installed in Mechagodzilla's wrists, allowing the robot to penetrate Godzilla's hide and paralyze the monster by destroying his second brain. Miki Saegusa, a young psychic, is ordered to become a part of Mechagodzilla's crew, and to locate Godzilla's spinal brain. She is reluctant to do so, due to her mental connection with Godzilla (established in Godzilla vs. Biollante), but follows her orders. The plan backfires when Rodan, having survived its battle with Godzilla and further mutated by radiation, responds to Baby's call and intercepts the UNGCC transport. The UNGCC is forced to send Mechagodzilla and Garuda after Rodan instead and, in the ensuing battle, Rodan is mortally wounded. Godzilla shows up moments later and attacks Mechagodzilla. When the two appear to be evenly matched, Mechagodzilla combines with Garuda. The upgraded Mechagodzilla, called Super-Mechagodzilla, carries out the G-Crusher plan and succeeds in paralyzing Godzilla. Suddenly, the dying Rodan, once again revived by Baby's call, begins flying towards Baby, but is shot down by Mechagodzilla, crashing atop Godzilla. Rodan's life force regenerates Godzilla's second brain and supercharges it. Now more unstoppable than before, Godzilla attacks and destroys Super-Mechagodzilla with a high-powered red spiral atomic ray. Godzilla finally locates Baby, who is at first afraid of the giant monster. Miki telepathically communicates with Baby, convincing it to go with Godzilla. The two monsters head out to the sea. The fifth film in the Heisei series of Godzilla movies was originally meant to be the last, in order to avoid competing with the upcoming TriStar American Godzilla reboot film and to honor the recent passing of Ishirō Honda. Toho had initially wanted to produce a remake of King Kong vs. Godzilla, but were unable to acquire the rights to use the King Kong character from Universal Pictures. When that project was scrapped, Toho considered pitting Godzilla against Mechani-Kong, a mecha first introduced in King Kong Escapes. The plot would have involved Mechani-Kong sporting syringes containing G-Force special forces which would have been injected into Godzilla's bloodstream in a manner similar to Fantastic Voyage, though the project was abandoned, as obtaining the rights to a monster even bearing the semblance of King Kong proved too costly. Producers Tomoyuki Tanaka and Shōgo Tomiyama felt that reviving Mechagodzilla was a logical next step for the series after the successful reintroduction of King Ghidorah and Mothra to contemporary audiences. Furthermore, effects artist Koichi Kawakita had already demonstrated his competence in designing and creating mecha contraptions like the Super XII, Mecha-King Ghidorah, and the machines featured in Gunhed. The decision to reintroduce Minilla (rechristened as Baby Godzilla) was made in order to appeal to the largely female audience that made Godzilla vs. Mothra a financial success, despite objections by director Takao Okawara, who held a low opinion of the 1960s movies the character had previously been featured in. In the original ending for the film, Godzilla destroys Garuda but is killed by Mechagodzilla. Garuda's nuclear reactor explodes and resurrects the King of the Monsters. Another ending was considered in which Godzilla's escaping life energy mutates Baby Godzilla into a new adult Godzilla. Toho promoted the film as Akira Ifukube's last performance as composer, and aired the children's program Adventure Godzilla-land, which portrayed Godzilla and Mechagodzilla as rival news anchors reporting on the events of the upcoming movie, as well as featuring the dance routine "Be like Godzilla". Shortly after the movie was released, Toho further promoted the film's merchandise by opening a Godzilla-themed simulation ride in Sanrio Puroland called "Monster Planet of Godzilla", which featured Megumi Odaka as the captain of a spacecraft which lands on a planet inhabited by Godzilla, Rodan, and Mothra, who are then accidentally transported to contemporary Tokyo. Kawakita made more extensive use of CGI than in previous Godzilla movies he worked on, and made an effort for the featured monsters to be less reliant on energy beams during battle sequences, particularly Rodan, who was portrayed via handpuppets and marionettes rather than through suitmation. Baby Godzilla was performed by series veteran Hurricane Ryu, and was designed to look much more dinosaur-like than his previous incarnation. Mechagodzilla was redesigned to be much less angular in form, and was performed by Wataru Fukuda. The Mechagodzilla suit itself consisted of multiple separate elements which Fukuda wore like plate armor. Kawakita originally envisioned Mechagodzilla being able to split into aerial and terrestrial units, though this idea was scrapped in favor of the character merging with the flying battleship Garuda. The new Godzilla suit was notably bulkier in profile than its predecessor, and had smaller shoulders and slimmer legs. The tail was also placed higher up the back, thus resulting in a very top-heavy appearance. Like the previous suit, the one used in Godzilla vs. Mechagodzilla II had an electronically operated head that could tilt its head independently of the body. The suit previously used for Godzilla vs. Mothra was recycled for the long shots during the battle with Rodan, the rampage through Tokyo, and the character's departure into the sea during the end credits. In past English releases, including dubbed films and video game titles, Rodan's name was pronounced "roh-dan." In Japan, however, his name has always been pronounced (and spelled in katakana) as "rah-dohn"(ラドン). In the English version of this film, the producers changed his name back to Radon, as it is in Japan. Columbia TriStar Home Entertainment released Godzilla vs. Mechagodzilla II on home video on August 3, 1999. This was the first time the film had been officially released in the United States. Instead of using the original monaural English dub, a newer stereo version was included, with the main characters' lines and most other dialog re-recorded by a mostly different Hong Kong cast. Most of the new cast did not start dubbing until the late '90s. The purpose or origin of this revised English version is unknown. TriStar additionally cut the end credits and created new titles and opening credits. The original version of the international dub is not known to have ever been released on video in its complete form. The only evidence of its existence is in the Hindi theatrical version. The Hindi dubbing company lacked a clean music and effects track and only had access to a copy of the original English version. Therefore, English dialog was muted and replaced with library tracks and music from other parts of the film itself, but occasionally the English source track was left intact. An anamorphic widescreen transfer of the "new" English version was later released on DVD by TriStar in February 2005 with the option to listen to the original Japanese audio. ^ The subtitles for the Japanese track are really "dubtitles" (the subtitles are actually the captions for the English track). The video transfer is simply a widescreen version of TriStar's print. This means the Toho logos and end credits have been cut and all the onscreen, optical text from Toho's international version has been removed or replaced by video-generated text. ^ This is a two-disc double feature with Godzilla vs. SpaceGodzilla. ^ a b c d e Kalat, David (2010). A Critical History and Filmography of Toho's Godzilla Series (2nd ed.). Jefferson, N.C.: McFarland & Co. pp. 196–201. ISBN 978-0-7864-47-49-7. ^ Ryfle, Steve (1998). Japan’s Favorite Mon-Star: The Unauthorized Biography of the Big G. Toronto: ECW Press. p. 293. ISBN 1550223488. ^ "American Kaiju: Mike Bogue's Articles and Reviews: Godzilla vs. Mechagodzilla 2". Americankaiju.kaijuphile.com. 1993-12-11. Retrieved 2015-07-30. ^ "Godzilla vs. Mechagodzilla II / Godzilla vs. SpaceGodzilla (Blu-ray) : DVD Talk Review of the Blu-ray". Dvdtalk.com. Retrieved 2015-07-30. "ゴジラvsメカゴジラ (Gojira tai MekaGojira)" (in Japanese). Japanese Movie Database. Retrieved 2007-07-19.